The chrome://flags page is a strange and wonderful trove of hidden settings for Google’s browser. It lets you peek under the hood of the application and tinker around with some experimental options not yet ready for prime time. Here are 16 of the most useful flag settings you might want to tweak. It’s worth re-emphasizing that these are experimental features—they might not work correctly and they might crash your browser. 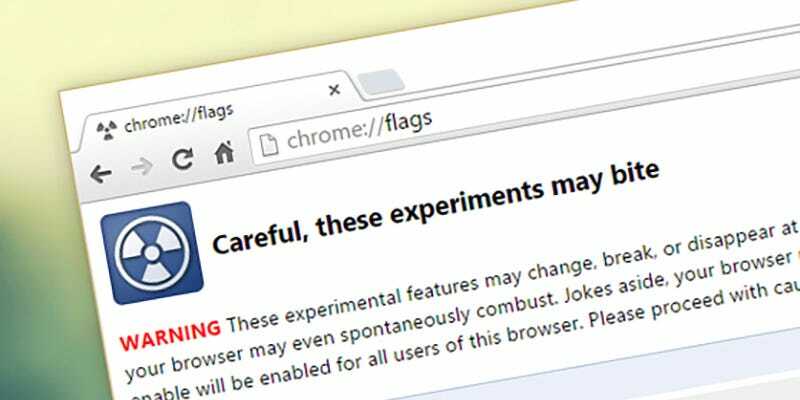 “We make absolutely no guarantees about what may happen if you turn one of these experiments on, and your browser may even spontaneously combust,” reads the official Google disclaimer on the flags page, a message we echo. A browser restart is usually required to apply the changes, and you can use the Relaunch Now button at the bottom for the job. If you get into trouble, use the Reset all to default button at the top of the flags list, or uninstall Chrome and reinstall a fresh copy from the web. 1. Enable automatic spelling correction: Instead of just having Chrome suggest a spelling change while you type, you can have it just go ahead and make the alteration while you continue to tap away. 2. Enable multilingual spellchecker: Speaking of spell checking, the Chrome flags page includes an option that tells the browser to look for mistakes in multiple languages at once. 3. Enable download resumption: A fairly straightforward one—this gives you the ability to resume downloads that have been unexpectedly interrupted. Handy if you regularly deal with large files and flaky wifi. 4. Download status in Notification Center: Gives you a pop-up desktop notification in Chrome whenever a new download starts, complete with shortcuts for pausing, resuming, and canceling the download. 5. Enable password generation: Tired of the same old combinations of letters and numbers? Have Chrome suggest passwords for you (via a key icon) whenever it detects that you’re on a new sign up page. 7. Save passwords automatically: By default, Chrome asks you if you want to save passwords for each site. But by enabling this flag, you can have it automatically store this information without prompting. 8. Material design in the browser’s top chrome: Add some of Android’s material design to your desktop. There are also separate flags for the Settings and Downloads pages, with the latter having the most dramatic effect on the visuals. 9. Smooth scrolling: An experimental feature that performs some behind-the-scenes wizardry to help pages flow smoothly from top to bottom even when the system is struggling. Integrated into Chrome OS. 10. Enable extension toolbar redesign: Want to see Google’s plans for the extension bar? Enable this flag, which puts icons for hidden extensions at the top of the Chrome menu for (slightly) easier access. 11. Enable large icons on the New Tab page: Google’s also busy redesigning the New Tab page with some bigger icons that make better use of the space—enable this flag if you want to take a look in advance. 12. Show settings in a window: Having the Chrome Settings in its own browser tab is perfectly convenient most of the time, but you might prefer it in a separate window, something this flag makes possible. 13. Emphasize titles in the omnibox dropdown: If you’ve ever found yourself wishing that the Chrome omnibox would show more search suggestions and fewer URLs when you type, this is the flag for you. 14. FPS counter: See the frame rate of a page (in frames-per-second) when hardware acceleration is enabled, via a small box overlay in the corner. More of a developer-centric option, but fun to try out nevertheless. 15. Enable tab discarding: Part of Google’s efforts to cut down on Chrome’s memory use, this abandons the contents of unused tabs when memory is low. The tab entry remains and the page reloads when you click it. 16. Enable Save Password Bubble UI: Another password-related flag, this one displays the prompt to save passwords in a pop-up bubble rather than a drop-down info bar. A small change but one you might like.